A purely Russian program was presented by Anastasia Seifetdinova - originally from Kiev - at the Heidelberg Klavierwochen Concert in the DAI [German-American Institute]. Some of the Rachmaninov Preludes, Op.23 were played at the beginning of the program by the pianist, who, having graduated from Würzburg, is now studying in the USA. Great emotion was richly integrated into her rubatic playing - making music filled with great depth and sincerity. The powerfully aroused "Alla marcia" in G minor was followed by the Andante in E-flat Major, with its beautiful poetry. Flexible but precise, the pianist connected the passages with rich emotion. She let resound the whole splendor of tsarist times in Mikhail Pletnev's transcription of Tchaikovsky's "Nutcracker" Suite. In the glaring light, sugary descant sounds were heard in the dance of the Sugar Plum Fairy, and in the rapid, churning, high-spirited Russian dance and especially in the rushing arabesques and sonorous sparkling runs of the "Andante maestoso". Anastasia Seifetdinova’s playing was stylish, and combined passion and elegance. These qualities marked her rendition of Mussorgsky's "Pictures at an Exhibition". The pianist delved deep into the imaginary visual world of this program music. She made miraculous fairylands appear, especially in the quiet episodes. And over and over she created strong contrasts between powerful and gnarled, and wonderfully quiet, poetic images. Particularly notable was her transition from burlesque exuberance in ‘On the square of Limoges’, into the dark brooding of the gloomy catacombs (in the next movement). Anastasia Seifetdinova initiated a lush piano playing, solemn as the full peal of church bells. She applied this lushness and solemnity of interpretation especially in the serene moments, the bell-like, long, fading chords: deep secrets, great silence, the restful beauty of sound - it all began to resound. Fascinating again and again, was the change from full-bodied fortissimo into the peacefully floating mysticism of pianissimo. The powerful moments were hard-edged and terse, and from Baba Yaga's hut the pianist let shoot high flames. The lively movements were rendered with strong rhythmic drive and the cycle sounded highly excited from beginning to end. In a grand cathedral sound shone the "Great Gate of Kiev" shone in its most beautiful splendor, played with a sound as if it were being performed in a grand cathedral. The pianist thanked her audience for their lively applause with two "Argentinian Dances" by Alberto Ginastera as an encore. "For a critic, hearing a new pianist with a truly warm, luscious tone is like breathing in the scent of jasmine blooming - a pleasure to be recalled again and again - and so I'm happy to report that form the first note she touched at her Weill Hall recital, Anastasia Seifetdinova was a genuine pleasure to listen to. Every piece, every measure, every note - no matter how complex the texture, no matter how many strands of melody and accompaniment - was wrapped in a halo of golden tone..."
"Für einen Kritiker, der zum ersten Mal eine neue Pianistin mit einem wahrhaft warmen, üppigen Ton hört, ist das wie atmen im Duft des Jasmins, ein Vergnügen, an das man sich immer wieder gern erinnert, und deshalb bin ich glücklich, berichten zu können, dass es vom ersten Ton an ein wahres Vergnügen war, Anastasia Seifetdinova zuzuhören. Jedes Stück, jedes Takt, jede Note war eingefüllt in goldenen Klang, unabhängig davon wie kompliziert die Struktur war, unabhängig auch von den unterschiedlichsten Strängen der Melodien und der jeweiligen Begleitung…"
Timothy Gilligan, New York Concert Review, Spring 2006. … Thematically, the program remained in the Scandinavian North with the subsequent Piano Concerto in A minor, Opus 16, by Edvard Grieg (1843-1907). The concerto, probably the most popular piano concerto in music history, was played, in a brilliant casting choice, by the young Ukrainian Anastasia Seifetdinova. Since there is no warming-up phrase for the soloist, the pianist must immediately show presence and powerful response to the orchestral entrances. But the young pianist easily overcame these hurdles, and reserved enough sound for the cadenza to build each chord up individually. Despite the frequent technical challenges, Seifetdinova especially in the second movement (Adagio) provided a high level of emotional participation. Beautiful as the piano - supported by sonorous strings – “sang out”, it was a completely unattached monologue. In the final movement, unbridled Nordic folklore breaks out, with the piano taking the role of initial signpost and innovator as the orchestra runs into dissonant tone clusters. A sincere applause for the performance of the soloist. … All in all, a very successful musical summer evening. The obligation of Anastasia Seifetdinova was a special coup for the DAI [German-American Institute]. The 25-year-old Ukrainian, who is currently studying with Silke-Thora Matthies (University of Music Würzburg) and Oxana Yablonskaya (University of Hartford/ Connecticut), is already an unusually sophisticated and style-confident artist. Her virtuosic refinement appears as natural as her expressive simplicity - a truly rare artistic talent. 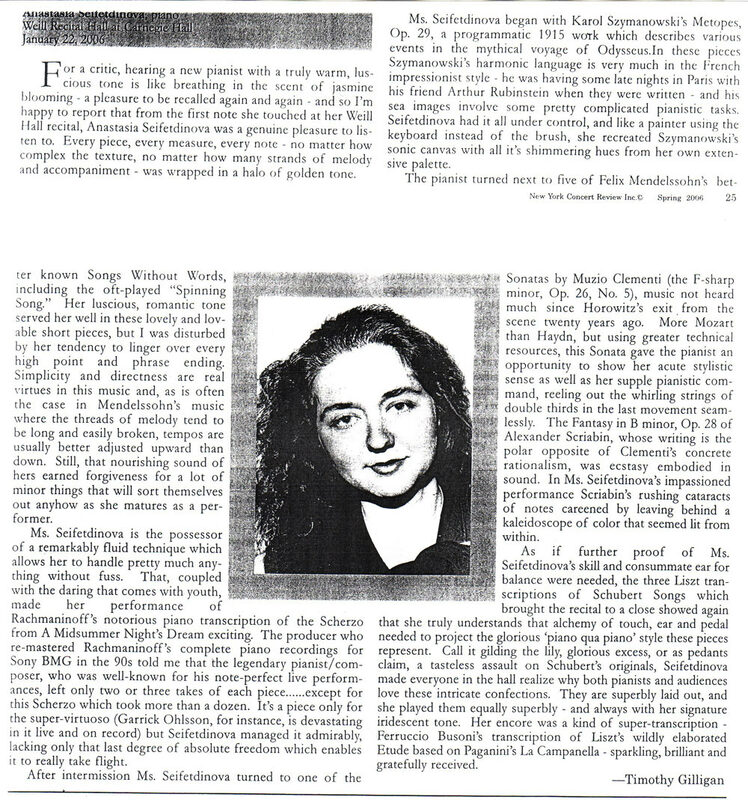 In the first half of the recital, she had already, with imposing clarity, juxtaposed "Metopes", Opus 29 (1915) by Karol Szymanowski (1882 - 1937), delicate colors oscillating between those of Debussy and Scriabin, with the tender-romantic, longing sound of Mendelssohn's "Songs without Words" (in a set of five pieces). Mendelssohn's enchanting, leggiero charm was brilliantly completed in Rachmaninoff's congenial transcription of the Scherzo from "A Midsummer Night's Dream". Similarly valuable was Seifetdinova's inspired plea for Muzio Clementi's dark, dramatic Sonata in F sharp minor, Op. 25, no. 5 (1790), which, despite its prominent advocates, ranging from Beethoven to Horowitz, is still waiting for its concert breakthrough (as, by the way, are the composers’ other first-rate sonatas). Especially in the elegiac, internalized "Largo e patetico" - the middle movement – and the bravura finale, “Presto”, sparkling with Clementi’s playful wit, and almost reminiscent of Scarlatti – the young Russian was striking as a fine artist of the first class. This memorable debut at the “Klavierwochen” Festival was crowned by the highly intelligent, formally organized, and yet vehemently expressive Fantasy in B minor, Op. 28, by Scriabin, and, equally effective, the tastefully celebrated Liszt collection (three Schubert song arrangements and "La Campanella"), where the exceptional talent of Anastasia Seifetdinova again strikingly reflected the richness of her pianistic facets. 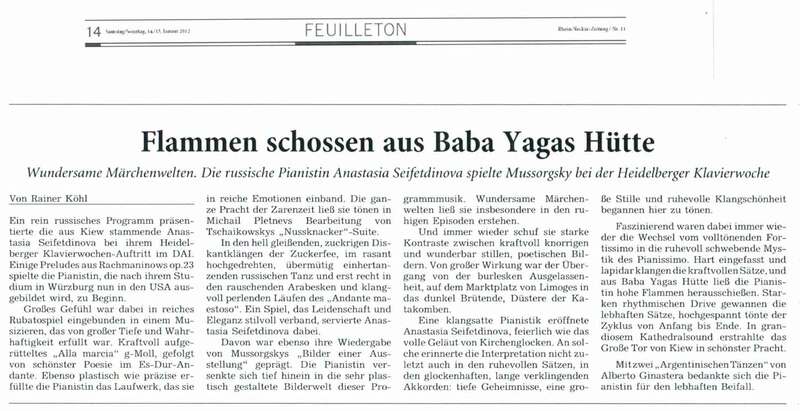 The young musician, who has been living for almost six years in Germany, thanked the DAI-audience for their enthusiastic applause with a repeat of Liszt's "Campanella" Etude. How many young men and women with ambition and talent try to conquer the world's stages? How many are trying to reach people and convince them their admission fee was money well spent? How many must you respect and admire for some qualities of their playing? And yet how many do we finally fail to deeply appreciate and approve, instead reserving that approval for perfection or better consistency? Which leads us back to the real thing: the music. Such is the case with Anastasia Seifetdinova. The young Kiev-born pianist did not take the easy route. She devoted her solo debut, in Tuscany Hall at the Würzburg Residence, entirely to the music of her homeland, choosing the extremely difficult and complex works of five twentieth-century Ukrainian composers - a risky and potentially unpalatable program. But Anastasia Seifetdinova played with great professionalism, composure, and presence, presenting wholly unknown and challenging works by Miroslav Skoryk, Lev Revuzky, and Boris Lyatoshinsky with ease and sovereignty, and pianistic elegance, swaying the many listeners. The same elegance and ease rendered even the less substantial works on the program impressive, leaving the audience with a sometimes ecstatic listening experience. Flattering movements like the waltz from Miroslav Skoryk’s Partita No. 5 (1975) - an eclectic retrospective not without charm - or Lev Revuzky’s first two Preludes, Op. 4 (1914) - reminiscent of glowing formations of Scriabin and Rachmaninoff - Seifetdinova succeeded in-sounding so rich and organic, so focused and dedicated, that neither the idioms of the past went missing nor the age of the piano went noticed. The highlight of the evening was certainly Karol Szymanowki’s delicate, feverish Métopes, Opus 29 (1915), three colorful, idiosyncratic fantasies of great modernity, replete with shimmering vibrating textures, sultry colors, and a rich range of chords and modes. The unobtrusive and warm-blooded Seifetdinova will reach many people with her great technical reserves, playing supple, agile, and weightless arpeggios and glissandos, and never losing her big, versatile sound. Her tempo structure is moderate, the rubato compelling and rhythm concise, and her rests and quieter moments are filled with music and power. Her rendition of Prokofiev's brilliant seventh Sonata was a ravishing success, and the large audience rightly filled the hall with its enthusiasm and bravos. Manchmal wagt man kaum zu atmen im Bann dieser Musik, die eine glückliche Pianistin zurücklässt und ein Publikum, das fast nicht aufhören will, ihr herzlich Beifall zu klatschen. 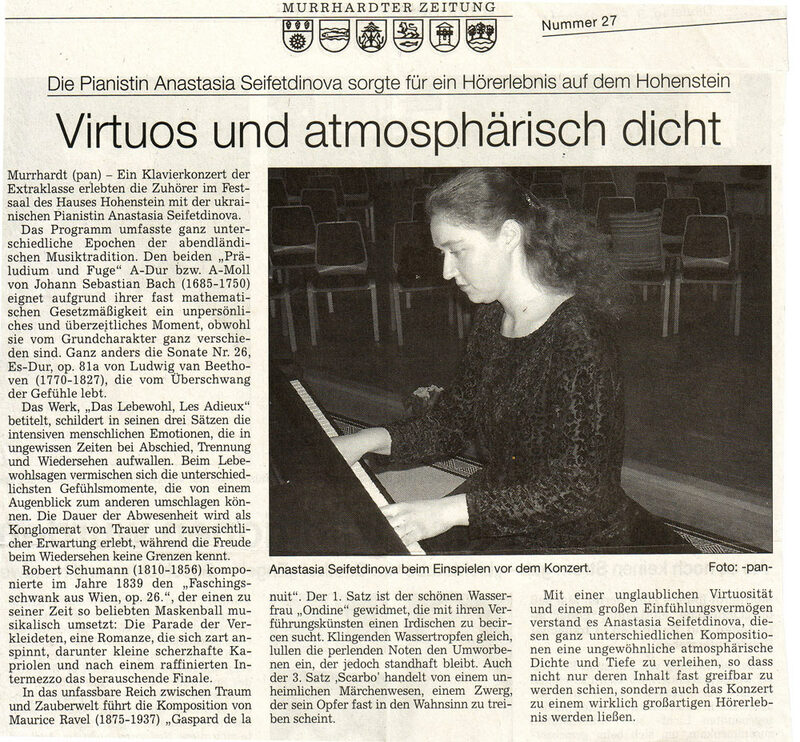 Die aus den USA angereiste Pianistin Anastasia Seifetdinova trat mit einem kontrastreichen und ausgesprochen anspruchsvollen Programm unter dem Titel "Romantische Klaviermusik im Original und als Bearbeitung" auf. 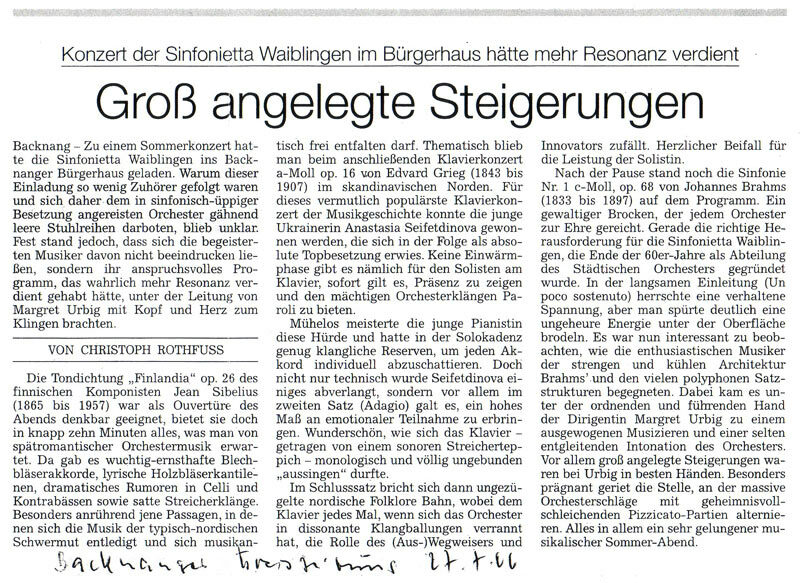 Neben einem originalen Werk von Schubert stellte die in der Ukraine geborene Pianistin Klavierbearbeitungen von einem Orgelwerk, einer Orchestersuite und zwei Liedern vor. 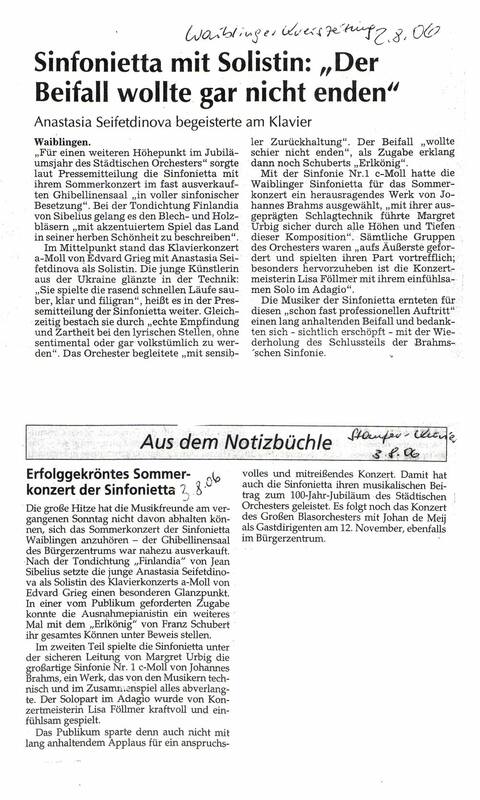 Ausdruckskraft und Schlichtheit, unglaubliche Virtuosität und Einfühlsamkeit füllten sich in jeder Note, Phrase und bei jeglicher musikalischen Struktur des Romantischen Klavierprogrammes. Nach ihrem Carnegie Hall-Debüt lobte der New Yorker Kritiker Timothy Gilligan im "New York Concert Review" Anastasia Seifetdinova über die Maßen, und er hatte Recht. Diese Pianistin spielte an diesem Abend wie von einem anderen Stern. Gleich zu Beginn überzeugte sie mit ihrer Dramaturgie der Darstellung von Liszts Transkription der Phantasie und Fuge in g-Moll für Orgel von Johann Sebastian Bach. Mit jedem Ton erzeugte die junge Pianistin das Gefühl, als ginge es um Leben und Tod. Nichts desto weniger war es für Seifetdinova wichtig, die polyphone vierstimmige Struktur sowie die massiven Orgelklänge herauszustellen und den Eindruck eines großen Kirchenraums zu vermitteln. In der folgenden Schubert A-Dur Sonate bestach sie besonders durch ihre gefühlvolle Weichheit des Anschlags in den melodischen Phrasen, ohne die harten Kontraste zu vergessen, die in der Schubertschen Musik darauf lauern, den Zuhörer zu erschrecken und von dem zerrissenen Wesen des Komponisten zu zeugen. Dabei war ihr Technisches scheinbar vollkommen unwichtig vor Musikalischem, und beinahe hätte sie noch einen Fehler gemacht, nur um zu zeigen, wie wichtig ihr die Musik ist. Die zweite Hälfte des Konzertes war den virtuoseren Klavierbearbeitungen der Romantik verhaftet mit wohlbekannten Stücken wie "Der Nussknacker", "Ave Maria" und "Erlkönig". Das Spiel der Pianistin änderte sich nun in eine ganz neue Stilrichtung. In einem atemberaubenden, virtuosen Feuerwerk brillierte die Pianistin mit Leichtigkeit, unangestrengter Natürlichkeit und Einfühlsamkeit. Tschaikowkys "Nussknackersuite" in der Bearbeitung des Pianisten Pletnevs, mit der jener 1978 den Tchaikowsky Wettbewerb gewonnen hat, ist eine der anspruchsvollsten Transkriptionen für das Klavier. 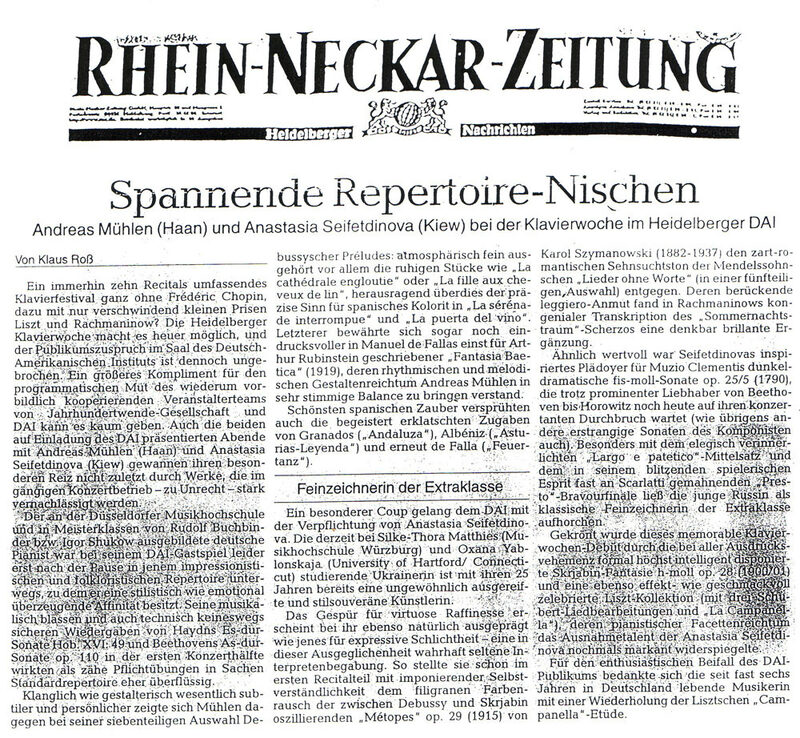 Es gelang Seifetdinova die besonderen Klangfarben des Orchesters nachzuahmen. Der orchestralen Bearbeitung folgten zwei Liedbearbeitungen. Die Transkriptionen von Schuberts "Ave Maria" und "Erlkönig" zogen den Bogen zurück zu der Liszts Bearbeitung, die zu Eingang des Konzerts erklang. Die Themen Liebe, Leben und Tod folgen einem rein romantischen literarischen Konzept. Wie ausgewogen diese heikle Bearbeitungen klingen können, ohne in nur kitschiges Klischee abzugleiten, demonstrierte Seifetdinova besonders gelungen. Riesiger Applaus eines sehr beeindruckten Publikums wurde belohnt mit der Zugabe von Chopins Nocturne. Damit hat Anastasia Seifetdinova dem Publikum einen flimmernden Nachklang ihres Konzertes geschenkt. Meisterhaftes Hörerlebnis. Ein Konzert der Extraklasse erlebten die Zuhörer mit dem Kammerorchester Plochingen und der großartig spielenden Pianistin Anastasia Seifetdinova. Mit unglaublicher Virtuosität überzeugte die aus der Ukraine stammende junge Solistin am Sonntagabend in der Stadthalle die zahlreichen Klassikfans. Sinfonietta mit Solistin: "Der Beifall wollte gar nicht enden"
Im Mittelpunkt stand das Klavierkonzert a-Moll von Edvard Grieg mit Anastasia Seifetdinova als Solistin. Die junge Künstlerin aus der Ukraine glänzte in der Technik: "Sie spielte die rasend schnellen Läufe sauber, klar und filigran"… Gleichzeitig bestach sie durch "echte Empfindung und Zartheit bei den lyrischen Stellen, ohne sentimental oder gar volkstümlich zu werden". Der Beifall "wollte schier nicht enden". The show began last Thursday at the Bushnell and started with two opening pieces. A Prokofiev Piano Concerto featured guest pianist Anastasia Seifetdinova, who played an illustrious revival of the piece with rich velocity. Mit einer unglaublichen Virtuosität und einem großen Einfühlungsvermögen verstand es Anastasia Seifetdinova, diesen ganz unterschiedlichen Kompositionen eine ungewöhnliche atmosphärische Dichte und Tiefe zu verleihen, so dass nicht nur deren Inhalt fast greifbar zu werden schien, sondern auch das Konzert zu einem wirklich großartigen Hörerlebnis werden ließen.